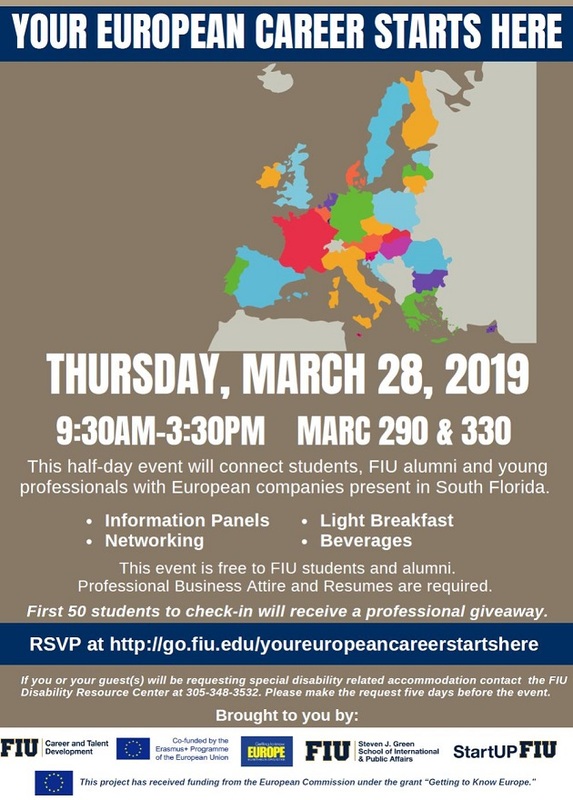 The Miami-Florida Jean Monnet Center of Excellence, in collaboration with FIU Career & Talent Development, is organizing a half-day career event to connect students, FIU alumni and young professionals with European companies, Chambers of Commerce and Consulates present in South Florida. Besides networking with those companies, students will receive information about possible career opportunities in Florida, the U.S., Europe and Latin America. They will learn about employment options with consulates and the private sectors in Europe, from internships to full positions. First 50 students to check-in will receive a professional giveaway. This event is sponsored by the Miami-Florida Jean Monnet Center of Excellence and organized in collaboration with FIU Career & Talent Development, and StartUP FIU.